The eusocial naked mole-rat is the mammalian equivalent of a social insect (click here for picture of naked mole-rats). They occur in the arid regions of Kenya, Ethiopia and Somalia (click here for a picture of habitat at Lerata, northern Kenya). In subterranean colonies that can commonly contain around 100, but sometimes up to 300 individuals, reproduction is monopolised by a single dominant “queen”, and one or two males. The rest of the colony act as “workers”, maintaining the burrow system, or “soldiers” defending the colony against foreign mole-rats or predators (click here for schematic of a typical colony). Although these small subterranean rodents may live in excess of 21 years in captivity, 98% are destined to a life of chronic infertility. Our current hypothesis is that behavioural interactions between the queen and non-breeders are translated into a suppression of gonadotrophin-releasing hormone in the hypothalamus, which in turn suppresses the release of gonadotrophins from the anterior pituitary. This results in a suppression of ovarian cyclicity and ovulation in non-breeding females, while in non-breeding males testosterone concentrations and sperm numbers are lower, and in most males sperm are non-motile. Not only does the queen suppress reproductive function in the non-breeders, but she also apparently exerts some control over the breeding male(s), such that concentrations of testosterone in the latter are suppressed except around the time of oestrus and ovulation in the queen. Despite these endocrine deficiencies in non-breeders that may persist for many years, the block to reproduction is reversible. Non-breeding males and females will rapidly become reproductively active if they are removed from the suppressing influences of their colony and housed singly or in male-female pairs, or if the queen in a colony dies. Studies of dominance within colonies have revealed that breeding animals have the highest social rank, while concentrations of urinary testosterone in the queen and non-breeders of both sexes correlated significantly with rank position. In queen removal experiments, reproductive activation in the succeeding female was accompanied by the development and expression of shoving behaviour. Succeeding females were also high ranking and had relatively high concentrations of urinary testosterone, supporting the hypothesis that the attainment and maintenance of reproductive status in the queen, and control of the social order of the colony, is related to dominance behaviour. It is thought that eusociality has evolved in naked mole-rats in response to constraints imposed by the rainfall pattern of their environment. Because the underground roots and tubers which form the staple diet of the mole-rats are more scattered in arid regions, and the soil hardness greater, the energetic costs of burrowing and the risk of not finding food by digging at random are higher. 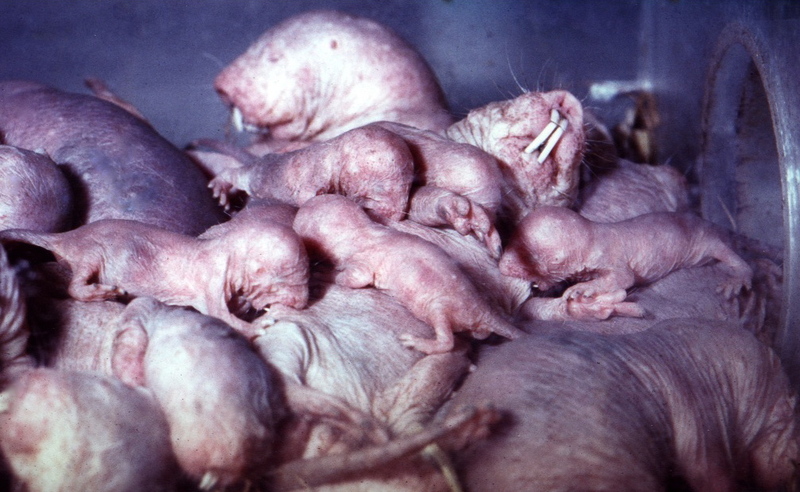 Thus by living in large social groups with co-operation and reproductive suppression, naked mole-rats are able to exploit an ecological niche where solitary animals or small groups would be unlikely to survive. Balanced against the benefits of sociality is the reproductive sacrifice made by most of the colony members. However, genetic studies of the naked mole-rat suggest that the costs of altruism to non-breeders are offset by inclusive fitness benefits, resulting from a high degree of intra-colony genetic relatedness.